Give a Gift that Gives Back: Sponsor a Barn Buddy! Have you ever wanted a horse or farm animal of your very own, but one wouldn’t fit in your living room? Sponsor a Barn Buddy! Your sponsorship will help feed, board and provide medical care for the animal of your choice and all of the rescued farm animals who find a safe haven at Longmeadow Rescue Ranch. For the person who has everything, a Barn Buddy sponsorship makes a fun and unique gift for holidays, birthdays, Mother’s Day, or any other special occasion. Membership card, Biography and Adoption Certificate for the Barn Buddy of your choice. Membership card, Biography and Adoption Certificate for the Barn Buddy of your choice, plus a cuddly plush! Membership card, Biography and Adoption Certificate for the Barn Buddy of your choice, plus a cuddly plush and a magnetic photo frame! 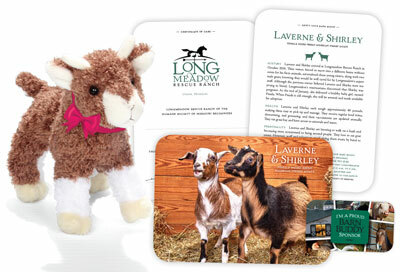 Membership card, Biography and Adoption Certificate for the Barn Buddy of your choice, plus a cuddly plush, a magnetic photo frame and an invitation to annual “Wagon Days” events at Longmeadow Rescue Ranch! Membership card, Biography and Adoption Certificate for the Barn Buddy of your choice, plus a cuddly plush, a magnetic photo frame and a private ranch tour at annual “Wagon Days” events at Longmeadow Rescue Ranch! Membership card, Biography and Adoption Certificate for the Barn Buddy of your choice, a cuddly plush, magnetic photo frame, a Barnyard Bunch greeting card set, plus a private tour at an annual “Wagon Days” events at Longmeadow Rescue Ranch!